The sun is out, and we are loving it! If you are looking for fun and practical bridesmaid gifts to thank your bridal party, we have you covered! After all, our new tropical beach collection is now available with beautiful summer bridesmaid gifts in fun colors and designs you and your bridal party will adore. In addition, we’ll go over practical gifts, summer bachelorette themed parties, and packaging ideas that will make your bridesmaids fall in love! 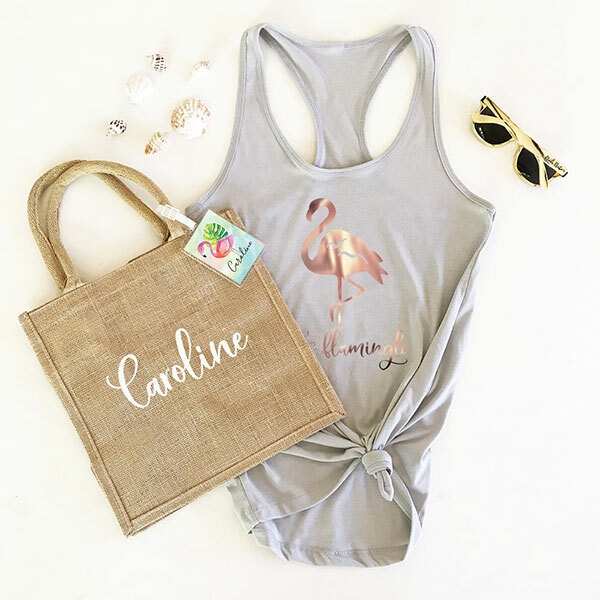 Personalized burlap totes make a great gift bag to give your bridesmaids for your bachelorette weekend! Each tote bag comes with soft cotton handles and is also personalized in a beautiful script font with the name of your choice. Don’t forget to fill them with all your party essentials and fun personalized gifts so your bridal party will always remember and cherish your bachelorette weekend. Want what’s pictured below? We carry tank tops, sunglasses, and luggage tags too! 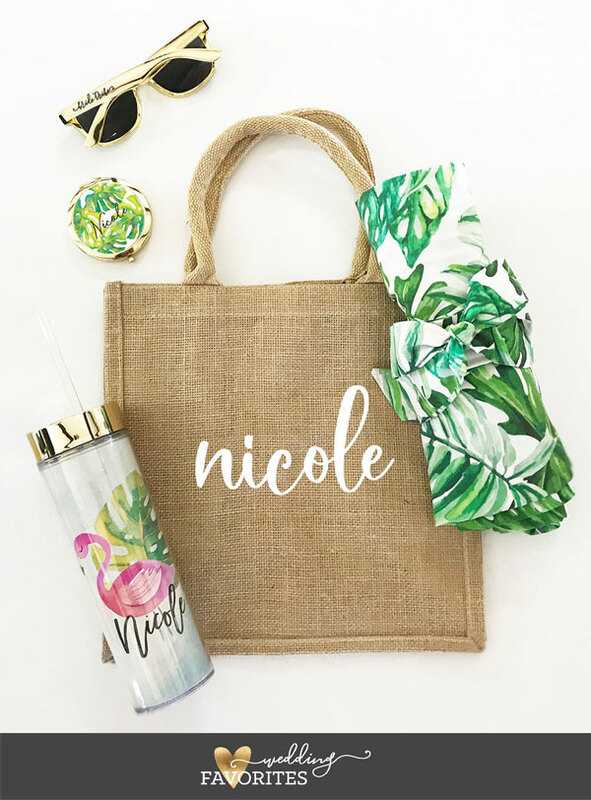 Just click here for matching tropical gifts and goodies your bridesmaids will love! Don’t let the long bathroom lines for a quick touch up ruin your bachelorette night! 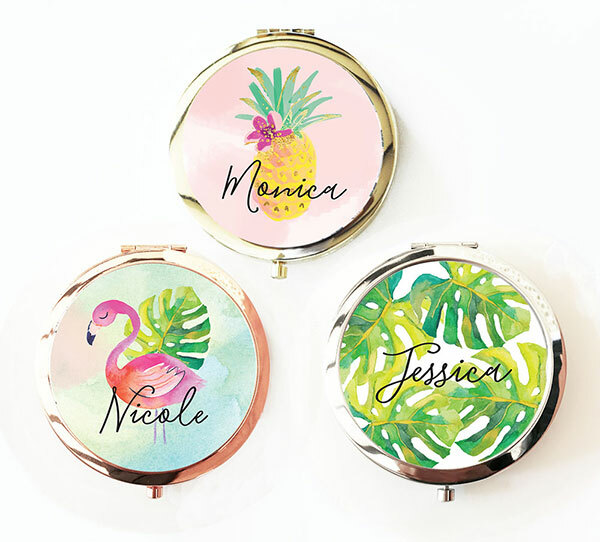 Handy personalized tropical beach compacts will have you and your girls looking great all-night long. Each compact mirror comes in your choice of a gold, silver, or rose gold mirror! In addition, these compact are personalized with a tropical background of your choice and a custom name for a complete summer look! For a fun DIY tip, we recommend including these in your bachelorette survival kits as an essential gift your girls will love and be able to use after the event. Keep you and your bridal party hydrated on your bachelorette weekend without sacrificing style! 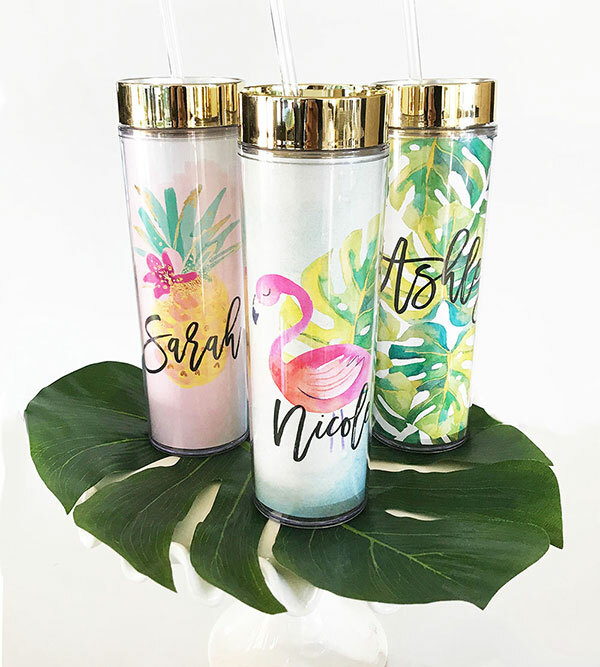 Each tropical tumbler comes with a fun design perfect for summer and can be personalized with a name of your choice. Not only do these tropical tumblers not sacrifice style, but they’re also BPA free! Definitely, a must have for any summer bachelorette. For a fun DIY gift idea we suggest making these bottles the packaging for your survival kit by filling them with essential goodies like matching lip balm, sunscreen, and more! Sunglasses are essential for any summer bachelorette weekend! 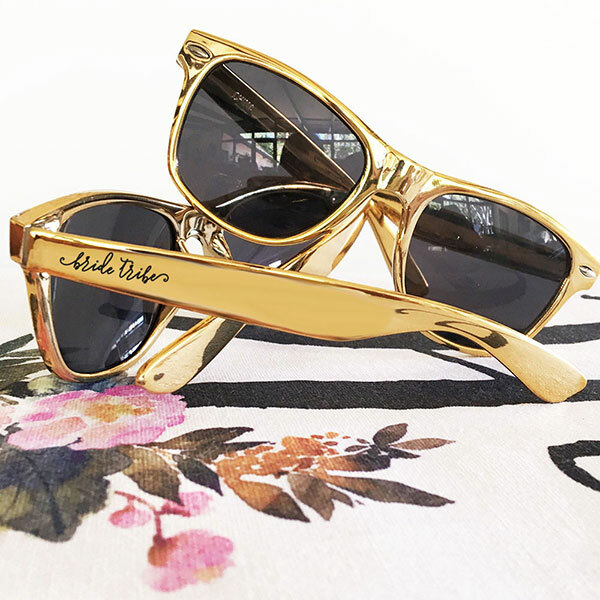 Each pair of gold bridal party sunglasses comes personalized in your choice of bride, bride tribe, or squad in black print. Don’t like any of our preset phrases? No problem! We also have these available blank, so you can use them for any event! These glamorous sunglasses are must-haves for survival kits for the day as well as the morning after. We’ve saved the best for last! Beautiful palm leaf robes make the perfect getting ready and thank you gift for your bridesmaids. Each delicate robe comes with a fun palm leaf pattern and a matching belt for the outside. Hand them out at your bachelorette or even on the morning of your wedding day! These robes are made of a lightweight cotton material that makes them perfect for summer and your girls will be able to use them after the event! Want them personalized for each girl? We have you covered! 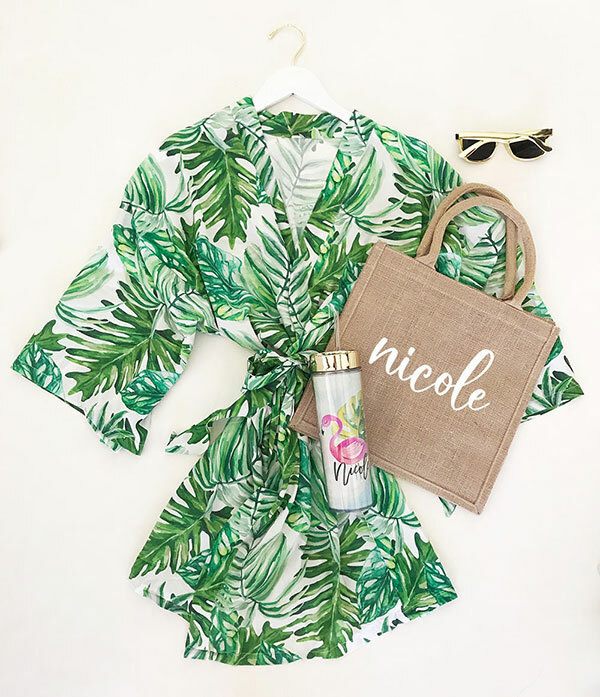 Check out our Monogram Palm Leaf Robes for a complete personalized look!